There is something about doing research and coming across an original, frayed and aged newspaper article (as opposed to a modern-day reprint) and finding an interesting write-up about a gang or even better, with pictures of the gang members themselves. Finding these items has happened to me on more than one occasion. 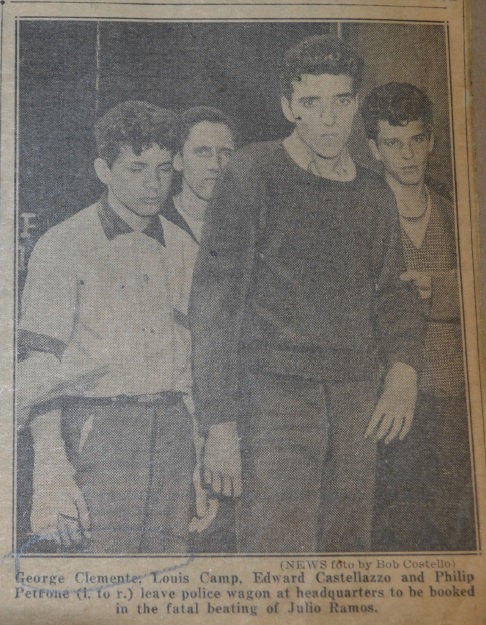 Below is a picture from the World Telegram and Sun newspaper of four Red Wings exiting the police paddy wagon to be booked on charges of murder for their role in the beating death of a Cuban man in Jefferson Park on Memorial Day in 1958. Pictured from left to right is Philip Petrone, Louis Camp, George Clemente and Edward Castellazzo. Also charged in the killing was Frank Monti, Norbert Belbo and Alfred Catino. To read more on that gang killing, click here.